Ha Tinh Province, Vietnam. He studied at the Industrial College of Arts. 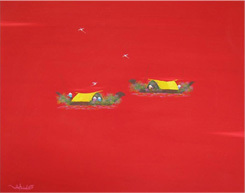 He has participated in many solo and group exhibitions abroad and in Vietnam. TVo Ta Hung lives and works in Hanoi. He is a member of the Vietnam Fine Arts Association and a lecturer of Arts at the Industrial College of Art.